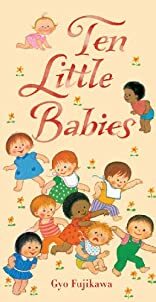 You can count on Gyo Fujikawa to create adorable babies- and this rhyming counting book has ten little ones to start the fun! All together the toddlers enjoy their bottles; then one throws his away, leaving nine. Naptime's next, as the group snuggles peacefully into a soft cloud- but a wide-eyed child starts to play and now we've got eight. The joyful hijinks continue as the tots get sticky with marmalade, get up to some naughty tricks, bang on the floor, and more. Page by page, the countdown continues until: One little baby, alone having fun. He became a grownup, and then there were NONE!